My personal journey learning the pedal steel guitar. Posts include description of the pedal steel guitar, approaches to learning the pedal steel guitar, buying a pedal steel guitar, copedants and more. I also have included links to steel guitar manufacturers, music software, learning resources and steel guitar conventions. 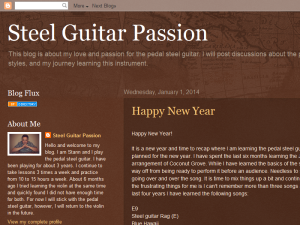 This what your Steel Guitar Passion Blog Ad will look like to visitors! Of course you will want to use keywords and ad targeting to get the most out of your ad campaign! So purchase an ad space today before there all gone! If you are the owner of Steel Guitar Passion, or someone who enjoys this blog why not upgrade it to a Featured Listing or Permanent Listing?